Motorola is planning to bring back its iconic Razr clamshell handset later this year, giving the phone that originally launched in 2004 a fresh update in the form of a full-length foldable touchscreen. However, it seems Motorola could have some competition from Samsung in the form of a new clamshell-design Samsung Galaxy Fold. 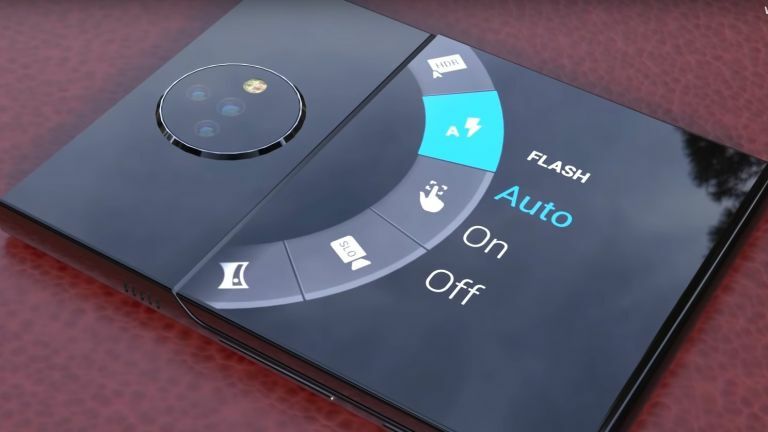 A patent application uncovered by Dutch site LetsGoDigital has revealed drawings of a clamshell handset, with its folding screen on the outside, that looks remarkably like a concept video of the 2019 Razr created by TechConfigurations and based on the latest leaks and whispers around the forthcoming flagship phone. Samsung's patent was filed with the World Intellectual Property Organisation (WIPO) back in September 2018 and published earlier this year. The drawings that accompany the application show a compact hinged-handset with a small switch that locks the phone when it's fully-extended in an open position. It's not known whether the Razr 2019 edition will actually put its folding screen on the inside (like the Samsung Galaxy Fold) or on the outside (like the Huawei Mate X), since Motorola has remained infuriatingly shtum about its plans. However, an early patent filing suggests that it will have its folding screen on the inside of the handset, with a smaller second screen on the outside. That said, in a recent chat with Engadget, Motorola Vice President of Global Product Dan Dery strongly suggested the company also considered putting the folding screen on the outside. "We have been testing a plastic OLED device with plastic film on top," he said, before adding: "The fact that you're touching [that kind of display] with your nails is scratching it. It has a short life right away; it starts dying the day you unpack it. But it's beautiful." That suggests the screen probably won't be on the outside when the Razr is released. Still, that's the layout that TechConfigurations took as their inspiration for the concept video below and it's a direction that it now seems Samsung is exploring, too. That Samsung is planning new form factors for its Fold handset is no surprise. Mobile CEO DJ Koh has previously said that the bendy Infinity Flex Display will be used in a more devices, including more foldable tablets, and laptops. Whether this particular iteration ever makes it from patent sketches to store shelves, though, is yet to be seen.